One of our most popular selling items in Looe was the train vehicle puzzle which unfortunately is no longer available. It was on display in the window and all day long would trundle around on its never ending track and would always draw attention. 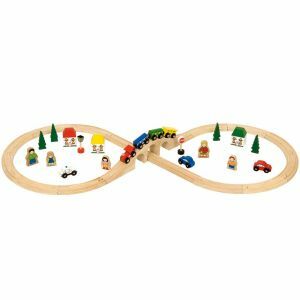 Originally there was a train puzzle, racing car, tractor, police car and spaceship but they have all slowly been discontinued. 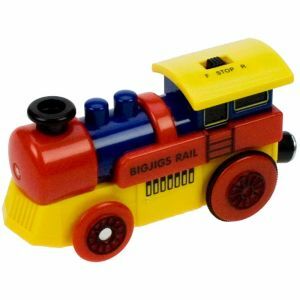 Looking for a replacement for the vehicle puzzle we are now selling this brightly coloured little battery operated train which will run on all the wooden railway tracks such as Brio, Thomas and other leading makes. At the front it has a little headlight and on the top is a button which can be moved to make the train either go forwards or backwards. 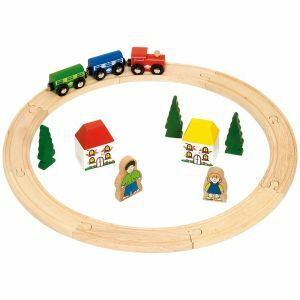 Very clever ly there is a magnet on the rear which will allow it to be connected to other train carriages which it will pull along behind, and it will make a lovely addition to our First Wooden Train Set right up our 40 Piece Wooden T rain Set. We also now have a range of other accessories for the wooden trains sets such as a 25 Piece Expansion Pack and the very nice Rail Sleeper Train. 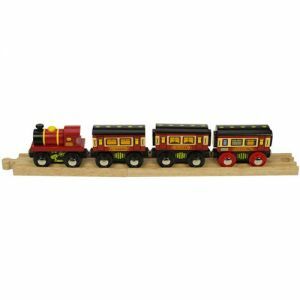 All in all if you are looking for a wooden train set or maybe to add to an existing one that you have then I am sure we will have something for you.